Competitive Runs (10K/5K): 9:00 a.m. Kids Fun Run (1-mile): 9:45 a.m.
to Reva Kautz at Edgewood Village, 3124 Colorado Lane in Bismarck. Thereafter, you will need to register the day of for $30. Registration and bib pickup at Sertoma Community Shelter from 8 – 9:15 a.m. The money raised from the race will be used locally for Parkinson’s specific exercise programs and to sponsor speakers and events to educate families regarding the disease. Registration for the Race for Parkinson’s begins at 8am at Sertoma Park Community Shelter near the amusement park. The kid’s 1 mile “Fun Run” starts at 9am; adult/family 1 mile walk/run starts at 9:20am; 5K walk starts at 9:30am; and the competitive 5K and 10K runs start at 9:45am. Early registration is $25 and the Kid’s fun run is $10. Registration the day of the event is $30. 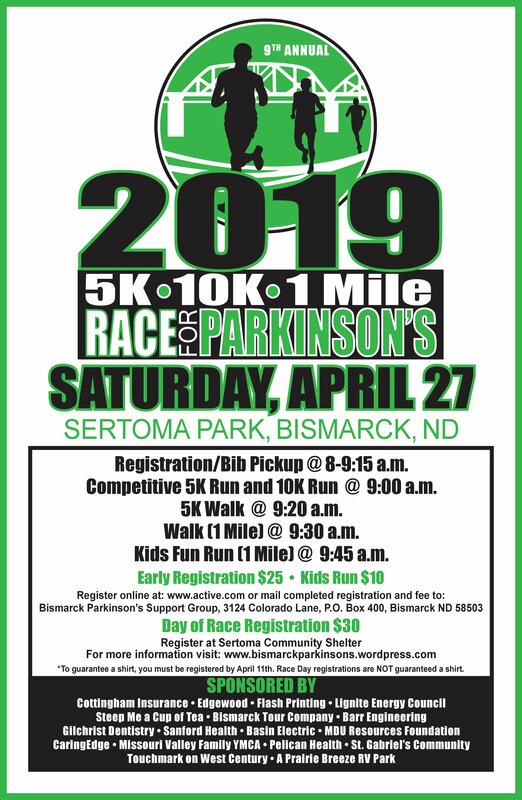 The registration form can be found on the Bismarck Parkinson’s Support Group website at www.bismarckparkinsons.wordpress.com under the Race for Parkinson’s tab or online registration is available at https://www.active.com/bismarck-nd/running/distance-running-races/race-for-parkinson-s-2018. Parkinson’s Disease is a brain disorder that leads to shaking and difficulty with walking, movement, and coordination. It is one of the most common nervous system disorders of the elderly, although it can occur in younger people. Parkinson’s disease affects not only the lives of the individual, but also those of their family and friends. While new technologies and treatments are being approved to benefit people living with the disease, we are still hoping for more effective treatments and a cure. 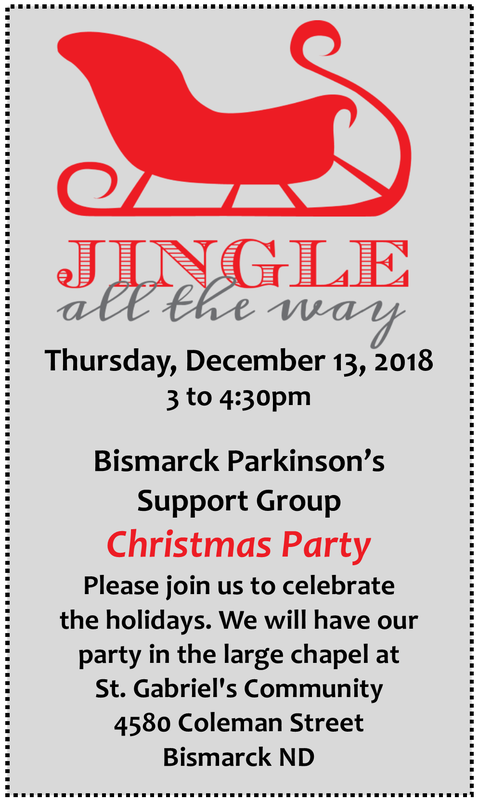 Our March support group speaker will be Beth Bakke Stenehjem an AT Consultant with ND Assistive. Beth will tell us about the assistive programs and what they do at ND Assistive. What is Assistive Technology and how can it help you live more independently and safely? Beth will also discuss Assistive Technology devices for safety and that can make your life easier. Please join us at St. Gabriel’s Community on Thursday, March 8. The monthly support group meeting for Thursday, January 11 will feature a speaker from AARP.